It may not have been a top of the table clash, but it was a Belfast blockbuster at Windsor Park last night. 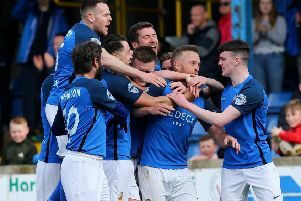 Stephen Baxter’s Crusaders got back on winning track in the Danske Bank Premiership campaign, claiming a crucial three points in a frenetic game, beamed out live by Sky Sports television. The result puts huge question mark over Linfield’s title defence -- they have now lost their last three league games. And, it’s their second defeat by the Crues this season. Paul Heatley, Gavin Whyte and Philip Lowry were on the mark for the home team, but own goals from Mark Stafford and Jimmy Callacher will give the Blues nightmares. Stafford made up for his error by scoring at the other end, while Aaron Burns’ header wasn’t enough to save Healy’s team from consuming yet another defeat. The Crues threatened after only three minutes, the impressive Whyte picking out the unmarked Jordan Owens, who completely mis-kicked his shot, but when the ball broke to Heatley, he shot over the top. But Linfield responded in the proper manner with Mark Haughey drilling in a thundering 20 yard drive that goalkeeper Brian Jensen tipped over the crossbar. The big shot stopper was called to action again, getting down smartly to beat away an Andy Waterworth shot after the big striker was sent clear by Aaron Burns. Crusaders forged ahead on 22 minutes when Jordan Forsythe crossed to Heatley and his low drive form the edge of the box arrowed into the bottom corner, beyond the outstretched glove of Roy Carroll. And, the Crues did it again 11 minutes later. This time Heatley sent Mark McChrystal free down the left and his low cross was turned into his own net by Stafford. Again the Blues attempted to bounce back with Millar drilling in a low cross that was whipped off the toe of Matty Clarke by the industrious Whyte. But when Millar chipped in the corner kick, Stafford climbed high above else to bullet home a header. But as the clock ticked down to the break, the Crues struck again in devastating fashion. Whyte took off on a penetrating solo dash, leaving Robert Garrett in his wake on the half way line. His cross was smashed against the crossbar by Matthew Snoddy, but Whyte was on to the rebound in a flash to fire home. Linfield still had time to carve out a decent chance before the whistle, but Lowry could only direct a Millar cross wide of the target. Linfield came out looking to repair the damage in the second half. Burns capitalised on a Colin Coates error to present Lowry with a chance only for McChrystal to get in a telling block. Millar was then sent free through the middle, but Jensen left his line to save with his feet. But the Blues got back into it on 56 minutes. Andy Mitchell provided a wonderful cross to Burns, who evaded the clutches of Coates, and he rocketed home a great header. Whatever David Healy said to his boys at the break, it worked. It was all Linfield at this stage, substitute Jordan Stewart fired a shot over the crossbar, before Clarke had a low drive cleared off the line by McChrystal. But it was game set, and match nine minutes form time when Whyte was allowed to waltz in from the right before smashing in a low cross that Callacher scooped into his own net. Substitute Lowry piled on the agony by side-footing home his team’s fifth three minutes from time after Whyte had picked the pocket of Callacher. LINFIELD: Carroll, Stafford, Haughey, Callacher, Waterworth, Lowry, Millar (J Stewart 59), Burns, Clarke, Garrett, Mitchell (rooney 79). Unused subs: C Stewart, Robinson, Quinn. CRUSADERS: Jensen, Burns, Beverland, Coates, Snoddy (Wad 82), Caddell, Forsythe, Heatley, Owens, Whyte (Carvill 90), McCrystal. Unused subs: Dougherty, Ward, Cushley, Carvill, Lowry.